"That it floats somewhere between memory and invention is deliberate, but where one ends and the other begins, I do not know... A random thought...."
Our trip began when we landed at Guwahati airport from Mumbai by noon. Guwahati - one of India’s ancient cities and one of the fastest growing cities in India today is an embodiment of the botched up growth of Indian urbanisation. 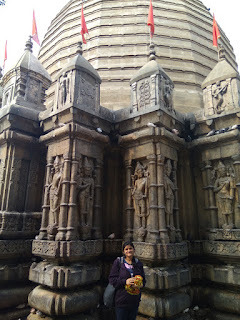 ‘Pragjyotishpura’ as it was once called is the largest city of Assam and north eastern India and is strategically very important as it connects the rest of India to the north eastern region. It is rightly called the gateway to the north east India. Guwahati derives its current name from the Assamese words “Guwa” meaning areca nut and “Haat” meaning market. It is one of those sites, where active sacrifices of animals and tantric rituals are carried out till date and in the mornings you will see devotees carrying goats for sacrifice. I personally abhor this practice and hence we paid a short visit to the temple and quickly dashed out. After just in time darshan at Kamakhya before it shuts for the afternoon, we stopped at a local ‘Whistling Woods’ dhaba on the Guwahati - Shillong highway. These are family run establishments which normally offer scrumptious non-veg meals with a limited but doable vegetarian fare. 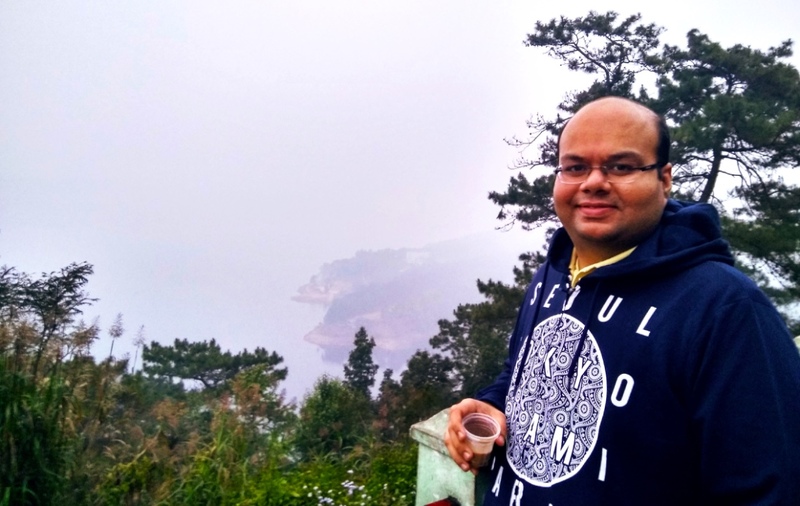 Post lunch it was a smooth ride of 3 hrs (~100 kms) directly to Shillong with the solitary break at The Umiam Lake viewpoint en route for an awesome cup of chai & some amazing views of the lake. We landed straight at Hotel Polo Towers in Shillong. Our home for the next 2 days. It is a very good 4 star property with all basic amenities provided for. There’s a nice open air lounge on the terrace where they serve drinks and finger food along with an in-house pub and a nice multi cuisine fine dining restaurant. The rooms were good and the service excellent and the wholesome and hearty breakfast was the one we enjoyed the most. I would surely recommend the place to anyone looking for a good experience which is also easy on the pocket in Shillong. After checking in and checking out the whole property, for the dinner we headed straight to the famous ‘City Hut Family Dhaba’ which was just a 5 mins walk away from our hotel. We had some of the best vegetarian food of our trip there. The portions were huge and there was ample of variety. The place served lip smacking Mughlai, continental and Chinese food. When travelling, one of the yardsticks I use in judging a food establishment is the number of locals eating there, and this place was literally full of locals and visitors. Thankfully we reached early by 7:45 pm and got the table, else would’ve had to wait. In case like us you’re a veggie - This is a must visit place in Shillong and has been consistently rated as one of the top restaurants in Shillong. Take the halt at Umiam Lake View Point just before you enter Shillong - You get some fabulous tea from the lady vendors - both with and without milk variants are amazing. After a relaxed night of sleep and scrumptious breakfast later, we were all charged up for the first day trip. We headed straight to the Indo - Bangladesh border check post at Tamabil. Located in the Jaintia Hills this friendly border post is used to ferry both people and a lot of cargo. As you cross the picturesque road from Shillong (85 Kms to Dawki) and approach slightly closer you will see truck full of cargo, especially, coal being transported to Bangladesh. The town of Sylhet in Bangladesh is just 55 kms from here. The new Guwahati - Shillong - Dhaka bus route that was flagged off by PM Narendra Modi & his Bangladeshi peer Sheikh Hasina uses this border route. 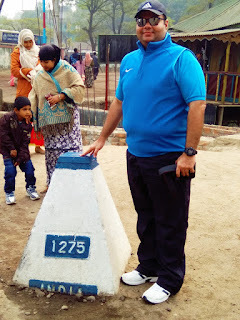 I’ve been to Wagah border earlier, but this was just a small trench, a nullah and a stone milestone pillar and some border security personnel strolling around on both sides. That was it. It is a great example of what a friendly border can be like, rather than the tense show of machismo we are used to at Wagah! After clicking a few pictures here, we headed straight to the picturesque Umngot River in Dawki. The river runs from the Indian to the Bangladeshi side of the border. It makes the whole border irrelevant as we could literally see people on both sides walking about and inter mingling freely. Raises few pertinent questions about undocumented illegal migration. That apart, we indulged ourselves in the magnificent and tranquil boat ride in the river in a wooden boat with a Khasi boatman. The famous crystal clear green waters of the Umngot River was indeed pristine. There were locals and tourists both frolicking, clicking photos, some even rafting, others including kids trying out different types of summersaults from the perched up rocks. This was the perfect setting, not too crowded but enough to permeate a happy yet peaceful vibe about the place. We thoroughly enjoyed the boat ride. The boatman takes you to the far end of the river and waits for you for a short halt to take pictures amidst the pebble filled river bed before he brings you back to the starting point. The ride lasted about 25-30 mins and costed Rs. 700/- but was absolutely worth it! We finished off our day with a visit to the famous Mawlynnong which was adjudged the cleanest village in Asia in 2003. Coming from a concrete jungle like Mumbai, we were really waiting in anticipation to see this beautiful village located in the east Khasi Hills. This village is 35 kms from Dawki and is best done as a circular day trip from Shillong - Dawki - Mawlynnong - Shillong. Some others who are nature lovers also prefer to opt for a homestay here and cover the famous Living Root Bridges and the surrounding village areas through an overnight halt. Honestly, we didn't find anything unusual about the place. It is a quaint and a remote little village with almost the same scenes you’d experience of locals sitting around trees, pets strolling around and the mirthful children playing around trying to tug at each other to make fun of the alien looking visitors in their blissful abode. The place is nice, but nothing special and the famed cleanliness also seems to be waning away. The award was won way back in 2003, it’s been 15 years now - principles of depreciation have applied here as well!! Unless you have serious budget constraint, avoid the public transport. Best to rent your own vehicle for the day trip. Kids at Mawlynnong - Always happy to pose! We started the day early and checked out post breakfast. We visited the famous Ward’s Lake and Elephant Falls in Shillong on our way to Cherrapunjee. The plan was to cover Cherrapunjee as a day trip and get dropped back to Guwahati since we had rented out the car. I had been to Cherrapunjee in November 2005 during my earlier trip and had enjoyed the natural beauty of the place to the hilt. The wonderful waterfalls like the Nohkalikai & 7 sisters waterfall, the hills covered in green, the eco-park and the limestone covered Mawsmai caves all made for an awesome day trip then and hence was keen to go again. Cherrapunjee was once famous being the ‘Wettest place on earth” receiving the highest density of rainfall anywhere in the world, but let me break the bad news to you, barring a couple of months of monsoon (July-Sep), the region has turned completely dry. Most of the tourists spots were in real bad shape when we went there, lying nondescript without much maintenance, attention or care. We visited the Eco Park, 7 Sisters Waterfall and the Mawsmai Cave - which was my favourite little 20 min adventure. After covering these spots, we headed straight to Guwahati in time for a late evening check in and called it a night after an early dinner. We wanted to rest well for the night so that we were fresh to take the next morning flight to Bagdogra from where our journey to the verdant hills of Sikkim and the 2nd leg of our journey was to begin!! Unless you are going during or just after the monsoon season upto early November, you can actually skip Cherrapunjee from your itinarary. The waterfalls are all dry for the rest of the year. While I love travelling and have been a wholesome wanderer for a large part of my life, I never really got down to penning down my experiences. I always used to be a reader of people’s travel blogs and adventures and was silently grateful to some of them for sharing their experiences which at times made my trips more meaningful and memorable. I finally decided it’s time to pen down my experiences, hoping, they’d be useful to other seekers. If not, I’d only be glad to have them documented as contribution towards my own nostalgia! Travel is indeed food for the soul. It liberates the mind from the routine and gives wings to creativity and becomes a great setting for introspection. It is the best form of detox. 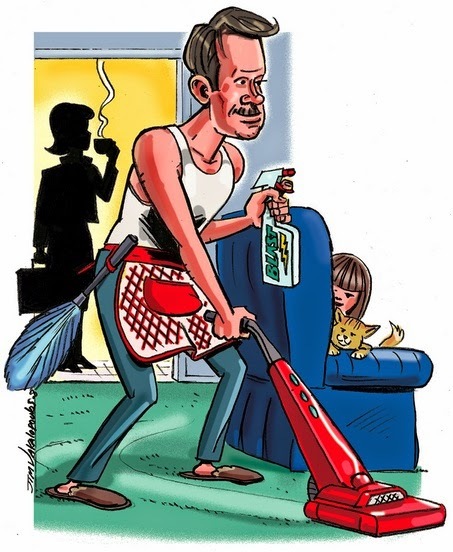 We’re a Mumbai based couple, both professionals, we ensure that we take time out every year from our corporate slavery in February to set off for a couple of weeks. February is usually a great time for a holiday with the weather, crowds and rates all magically converging to satiate your wanderlust! The fact that it is also our anniversary month seals the deal for us! This year, we actually started our planning pretty late (December) and eventually even succumbed to the temptation of having a travel consultant plan it for us and took significant trouble to explain the nuances of our preferences to the guy as well. The pathetic ‘one size fits all’ response received from him, sealed our distrust and disgust towards anything ‘readymade’ when it comes to our holidays. After a lot of deliberation, weeks of arguments, fights, forecasted budgeting and couple of ‘This is my side of the bed’ kind of friction, we finally agreed upon North East India as the destination for our 2018 adventures! (2015 was Thailand, 2016 - Sri Lanka, 2017 - Uttarakhand). While I had been to the north east through a fabulous youth exchange program via the Rotaract Club - The youth wing of The Rotary International, my wife had never been there. I am appending our 15 night - 16 day itinerary along with all the details of the places we covered and shall also break down each segment in detail in subsequent blog posts with the hope that it would help you plan your trip better with important tips thrown in! So this is how it went…. We're 3 weeks into the new year and I have been still contemplating on my new year resolutions. Yes, I am one of those who made resolutions every year. Most of them remained in my mind for a few days. Work on some started and faded before the first month did. The others were never compelling enough to start with. "I will loose weight this year" - "I will write a book this year" - "I will update my blog regularly this year" - "I will play a sport of choice this year regularly" etc etc were the resolutions. What drives us to do or refrain from doing something is tangible goals linked to material outcomes. While stretch targets are good, I for one, believe in setting up achievable short terms goals. Once you meet your short term target, it's best to re-assess and set yourself the next target. That way, we can keep ourselves motivated through small accomplishments and in the end land up achieving more. Keep adding to the list - Life is not static - why should our goals be? I have already started work on some of the items above. Even though I may not achieve everything I set out for, I am at least glad that it is nudging me to do things I enjoy doing. 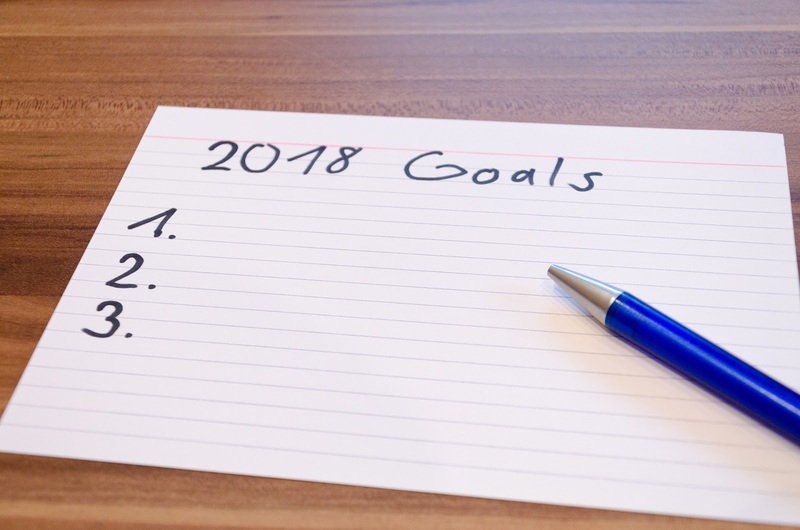 Have you listed down your 2018 Goals? In the 1987 epic movie 'Wall Street' - The protagonist essayed famously by Michael Douglas exclaims emphatically in defence of greed the following lines - "The point is, ladies and gentleman, that greed, for lack of a better word, is good. Greed is right, greed works. Greed clarifies, cuts through, and captures the essence of the evolutionary spirit. Greed, in all of its forms; greed for life, for money, for love, knowledge has marked the upward surge of mankind." Like sometimes they do, these words have figured out a way to etch themselves in my memory. Last year, my wife and I, took our annual vacation to the hills of Uttarakhand covering Nainital, Rishikesh, Dehradun, Mussoorie, Landour and Haridwar over 2 weeks. The places were indeed mesmerising with picture postcard beauty and some really memorable experience. 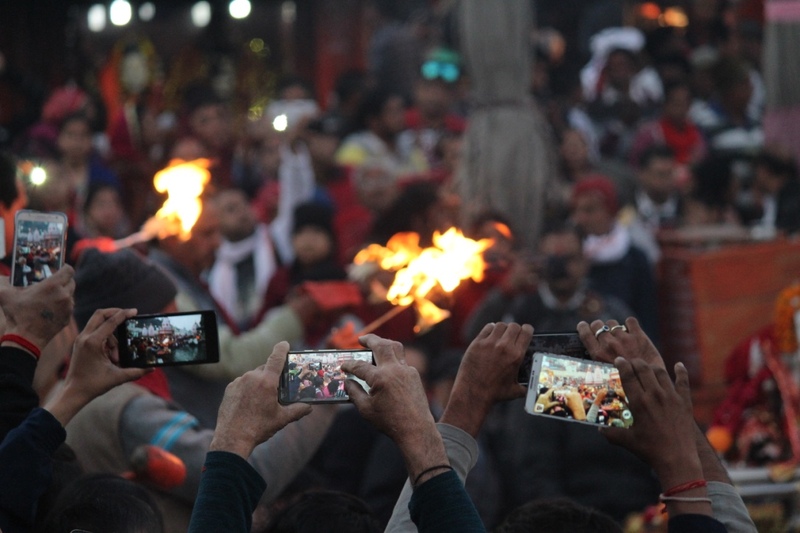 One such experience for us was that of the legendary 'Ganga Aarti' performed in the evening on the banks of the holy river Ganga. The Aarti was indeed once in a lifetime experience. A heady concoction of faith, spirituality, energy and divinity. The image I captured above, stayed with me and resonated with me at a much deeper level. It made me wonder in astonishment about us as a society today. On things & experiences that are important to us and how our social interactions have changed in the age of technology. I'm fairly sure that a majority of people who would have participated in this great Aarti in times gone by would've surely chanted away the mantras with folded hands or clapping their hands with religious fervour. Not now, you will see cameras and flashes above. This to me is the essence of greed. Now, we truly want more from our experiences. We want to not only experience them, but capture them for posterity. A step further, share it to elicit reaction of wonder, astonishment, appreciation from those whom we share it with. We want to express ourselves. Put ourselves out there for others to have views. At times, we want to codify our experiences and record them for our own memory so that we can revisit them at our fancy at a later date or pass it down along with material things of possession. 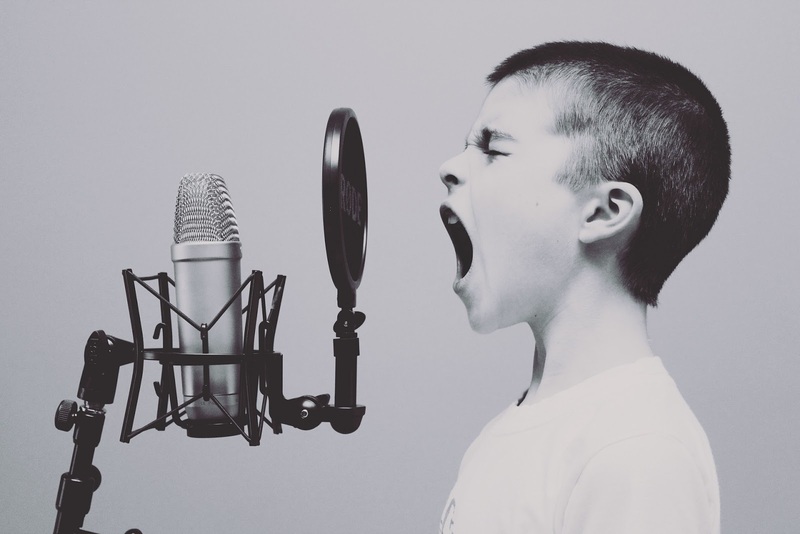 Our recorded experiences & emotions are our emotional currency. They can be hoarded to inflate emotional wealth, or shared to compound it! Social Media as the emotion banks of tomorrow? It is my attempt to rekindle my romance with the written word. I present to you "Voices" - A series of short prose blogs inspired by our basic need to express ourselves. Feelings, inspirations, private conversations, negotiations, prayers, confessions, declarations, resolutions.... they all have the power to create magic if shared... more importantly if expressed! We can never fathom whom they would resonate with and how. What they would lead to and how! So for my part, I express.... to explore the power of human expression through "Voices".... Hoping to be heard! Here's my inspiration behind this series: One of my favourite ad campaigns of all time! Airtel - "Dil ki baat bata kar toh dekho"
It is, I think my duty to heed to the barrage of emotions. They plant seeds of doubt and the harvest of doubt is seldom fulfilling. Hundreds of emotions jostle for space reminding me of my own ride to and from work in the Mumbai local. There is diversity & discomfort but there is also a sense of familiarity. I was always the one to admire someone else’s creation. Oh yes, even this requires serious talent. At the most, there would’ve been instances where, I would have worked to better someone else’s creation, mostly in lieu of a reward. But this is indeed different. I have never created anything till date. I just did. She looks more beautiful than anything else I’ve ever seen or hope to see. She was early, maybe by a month. She is happy. More importantly she’s content. We made her. She made it. She fought, we won. Happiness is gradually succeeding in usurping mind space. Perhaps this process is what they call - “Sinking In” - She’s here… I am a father now! Each New Year, we Indians wake up to a million new wellness resolutions. From promising to lose kilos to enrolling for yoga classes to even the simplest of morning walks tops the charts of our resolutions. India is slowly but steadily waking up to the benefits of a healthy lifestyle. Wellness is the new mantra and fitness the new fad. While it’s an extremely welcome trend in this otherwise food, cricket and Bollywood obsessed nation, a majority of us however, are victims of consumerist health activism which is largely driven by economic rather than healthy motives. Restaurants are dishing out the so called ‘organic’ or ‘nutritious’ dishes on the menu at a steep premium along with the traditionally unhealthy fare. The Wellness Spas, gymnasiums and other holistic fitness centers are mushrooming all over the country promising to rejuvenate our bodies, and souls through a variety of scientific sounding rituals along with exotic sounding therapies. With a growing number of Indians willing to pay big bucks to feel good, the country's fitness and wellness industry is blossoming. Celebrities from Zaheer Khan (Cricket) to John Abraham (Actor) all hopping onto the bandwagon of being fitness entrepreneurs, the industry is poised to grow to an estimated Rs. 1 lakh crore by the end of 2015. Today morning, my maid decided to call in sick. (I secretly know she must’ve partied hard last night) and hence out of necessity, the situation gave birth to an awesome workout for my wifey and me who decided to rise to the occasion, albeit with our handful of mops and dusters to clean the whole house. And now when the workout has ended post almost 3 hours of shared rigour, we feel not only much better but almost victorious. The other benefit is that we now have a sparkling house! Try it.... This workout works!!! 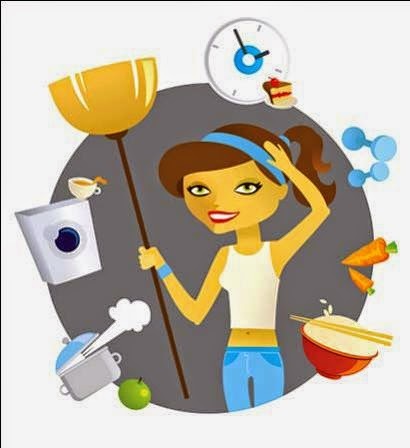 You can really quantify your workout doing household chores - Find out how many calories you burnt doing household work! A trip to the theater is a social event. It’s best enjoyed in the company of your loved ones. The definition of terms ‘loved ones’ being flexible depending on the contents of the film. Movies are a great reference point for life and even in the movies, I’ve never seen anyone ever go for a movie - alone. It is an axiom of adult coolness that going alone for a movie is downright weird and looserish. It will instantly make you a loner and perhaps even socially challenged. It will make your friends believe you’re deranged, and make your parents instantly suspect that you’re battling demons of a break up from a relationship you never disclosed to them in the first place! There are some acts which give you a feeling. They leave you with an after taste. The kind of after taste you get when you down the last morsel of your first self-cooked meal. You face apprehensions, you battle perceptions, and finally you accomplish what you never thought could be the possible outcome. There’s something so muffled about the way we experience things. It is as if we’re trying to slip through life without challenging some of the rules someone else has carved out in stone as benchmarks of generally acceptable social behaviour! Well let me not sound all Martin Lutherish to have challenged the social norms, but in all practicalities I tried to gather ‘company’ for this one movie I've been wanting to watch for some time now. However, the hazards of a 6 day working life with a respectable private company today require a pre-ordained miracle to unfold whereby the universe conspires to make a movie outing with friends possible for you in lieu of you good karma from your last avatar. Date, time, location, ticket availability, interests and budgets of the diverse species called your friends have to all conspire to come together seamlessly for you to successfully accomplish a movie outing. Come to think of it and rewind your last few movie outings with your friends. I’m sure it would've involved some for form of ‘adjustment’ (You would've blamed me for being too harsh had I used ‘compromise’) from someone. PS: It really felt nice, the 'Me' time was indeed welcome!!! Besides, it going to be the last week for 'The Wolf of Wall Street' at the movie halls, didn't wanna miss this one!!! Who gets to determine when the old ends and the new begins? It’s not a day on a calendar, not a birthday, not a new year. It’s an event. Big or small. Something that changes us. Ideally, it gives us hope. A new way of living and looking at the world. Letting go of old habits, old memories. My Sunday opened with reading news of closures. Two heartbreaking ones. 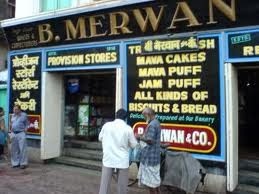 Yes, the 100 year old B Merwan & Co, more affectionately referred to as Merwan’s - the bakery & restaurant in Grant Road will shut shop come 31st March, 2014. Much before Mumbai found it fashionable to be up early for a jog thanks to the Mumbai Marathon, Merwan’s used to wake Mumbaikars up and line them up outside its store as early as 5-5:30 AM for the freshest batch of Mawa Cakes. It is common to return disappointed if you were to reach by 7 AM. The owners & bakers themselves used to be at the shop at 3 AM daily. There was clearly more to this enterprise than money, it was love! The Brun Maska, omelettes and the custard have been companions to those intimate conversations or just plain jovial banter. The chairs made in Czechoslovakian wood or the Italian marble topped tables were the ambience which catered to a Bombay, yes Bombay and not Mumbai, which was home to the most cosmopolitan Indians truly secular in their approach. A mill worker, an old Parsi Bawaji or be it the budding college couples bunking lectures to catch the matinee at Minerva closeby, it served wholesome honesty and love to everyone, equally. 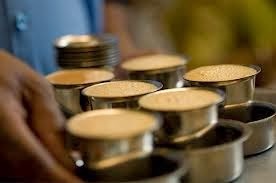 The glass ‘Barni’ which kept your ‘Khari / Bun Pao’ safe or the ‘Jam Puff’ which used to be the eternal reward, will perhaps now realise, that it is not just entrusted with the khaaris but is also a custodian of a million moments of nostalgic timeless experiences which many would now call memories. The other closure refers to the report of the ever dwindling number of Udupi restaurants in the city. Once they dotted the street corners of Bombay with the same humility that personified the people of this city. They were so closely interwoven with the social fabric of this city through the late 50’s till date that reading reports of more than 90 Udupis shutting shop in the last 2 years feels akin the gradual but disturbingly familiar disappearance of the sparrows from our windows. Their beauty lied in their honesty and simplicity. Their menus didn’t run into endless pages, neither did they resemble designer catalogues. The food was not tiny morsels dished out in choicest of porcelain, the waiter was not the suave gentleman, but your friendly lungi clad ‘Thambi’ – They were our first tryst with amazingly refreshing filter coffee, minus the intimidation of the decision making one goes through while ordering a coffee nowadays (Short, tall, light, dark, caf, decaf, low-fat, non-fat, hot, iced, blended etc...). Yes, the place did not boast of anything it wasn’t but still managed to not only nourish your hunger pangs but satiate your soul. Some of its wall sported matter of factly – “This place is not for meeting – only for eating” – That’s perhaps the refreshing honesty we fail to appreciate today. What’s important is that we never stop believing we can have a new beginning. But it’s also important to remember that amid all the crap are a few things really worth holding on to. Who gets to determine when the old ends and the new begins? "A promise is a promise..." - Ratan Tata... while unveling NANO!! wat a man!! "When we think we know all the answers, life comes and changes all the questions." "Those who think they know everything...annoy those of us who do!!" "Treat each day as your last one... 1 day you'll be right!!" "If your enemy is superior, evade him. If angry, irritate him. If equally matched, fight, and if not split and reevaluate." "Greed captures the essence of the evolutionary spirit." stick with you through thick and thin. "Courage is not the absence of fear but rather the judgment that something is more important than fear. The brave may not live forever, but the cautious do not live at all!!!"